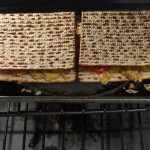 Since I started this blog, every year I have created a Passover grilled cheese sandwich. 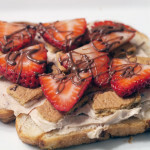 Those sandwiches featured various Passover ingredients, such as hard boiled eggs, horseradish and apples. When I started to think about what ingredients I would use in this Passover grilled cheese, I started and stopped at celery. Yes, celery. Not that exciting in the least and unfortunately, not really a basis for a great Passover grilled cheese sandwich. 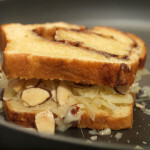 I tossed around the idea of a Passover dessert grilled cheese, but didn’t get too far with that idea either. 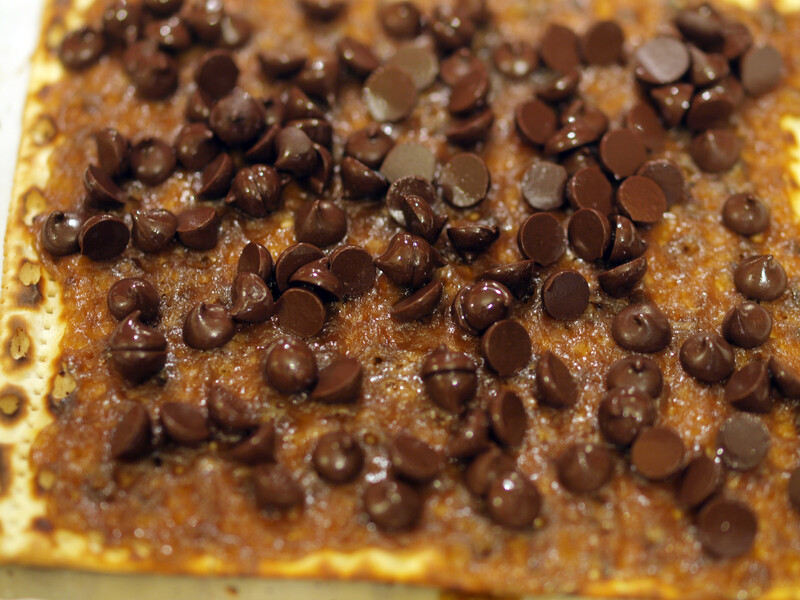 Thankfully though, while at Whole Foods, I checked twitter and stumbled on Yumsugar’s recipe for Chocolate Covered Almond Matzo Toffee (or in my case, Almond Toffee Matzoh). From there, everything fell into place…even if this year’s Passover grilled cheese is not 100% original. When I think dessert cheese, mascarpone is the first variety comes to mind. It simply, at least to me, is the go to dessert cheese and why I used it to turn this dessert into a dessert grilled cheese. Mascarpone (pronounced mahs-car-POH-nay) is best known as an ingredient in the Italian dessert tiramisu . It’s creamy and slightly sweet from the cream it’s made of. When it comes down to it, mascarpone really is just thickened cream that’s on it’s way to turning into butter. It’s made from only two ingredients, whole cream and citric or tartaric acid (to thicken the cream). That’s it. The process is so simple you can even make your own mascarpone cheese at home. 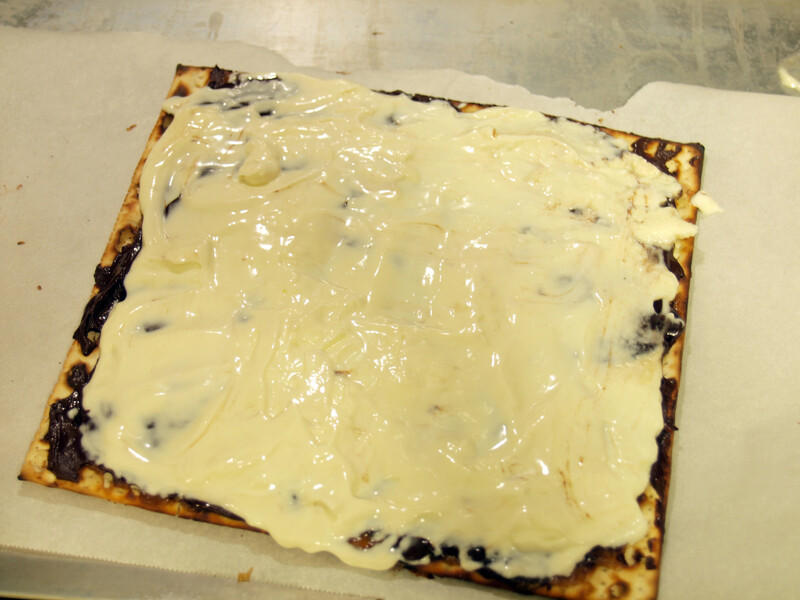 To those that have to deal with Matzoh 8 days once a year, the flavor, or lack thereof, gets old real quick. That is why we need to spice it up with almond toffee, chocolate and other various ingredients. The original recipe called for everything that I included, except for the macaroons and mascarpone. The sous chef thought adding crumbled up macaroons on top would be a nice touch and would include another Passover ingredient. And of course I needed to add some sort of cheese in order to make it a grilled cheese. 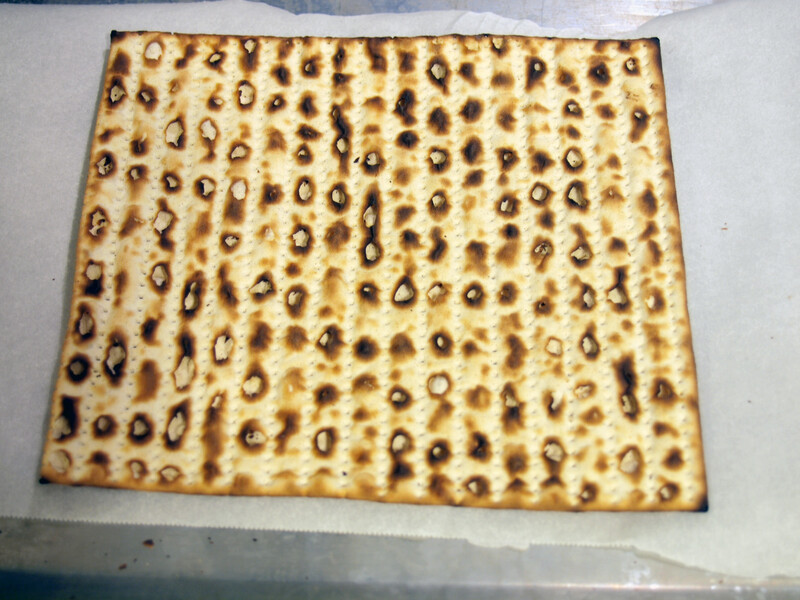 FYI: Since I was only making one serving out of one piece of matzoh, as opposed to 30 pieces made out of 4-6 pieces of matzoh, I simply used the recipe as a guide and would suggest you do the same based on your desired serving size. I have tasted toffee, and possibly almond toffee, many times in the past. However, I never knew how it was made or even that it was so easy to make. Cook some brown sugar and butter together and you have yourself toffee. 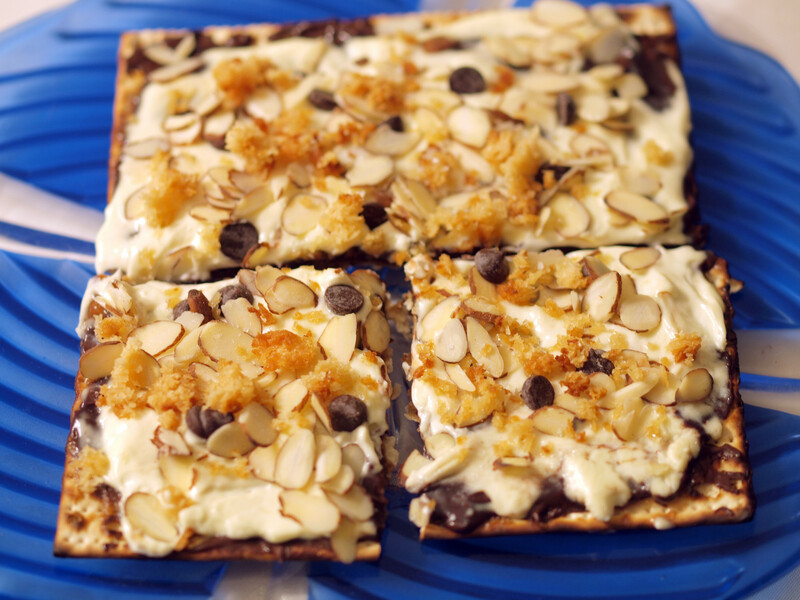 Throw some almonds on there and you have almond toffee. Delicious, homemade almond toffee. It really is as simple as that. So yummy. The instructions are well described in the actual recipe so I don’t want to be repetitive but I do want to point out the differences in my grilled cheese. In the recipe, the ingredients include vanilla but I never saw it used in the instructions. I went ahead and added about 2 small drips of vanilla in with the brown sugar and butter when I made the almond toffee. 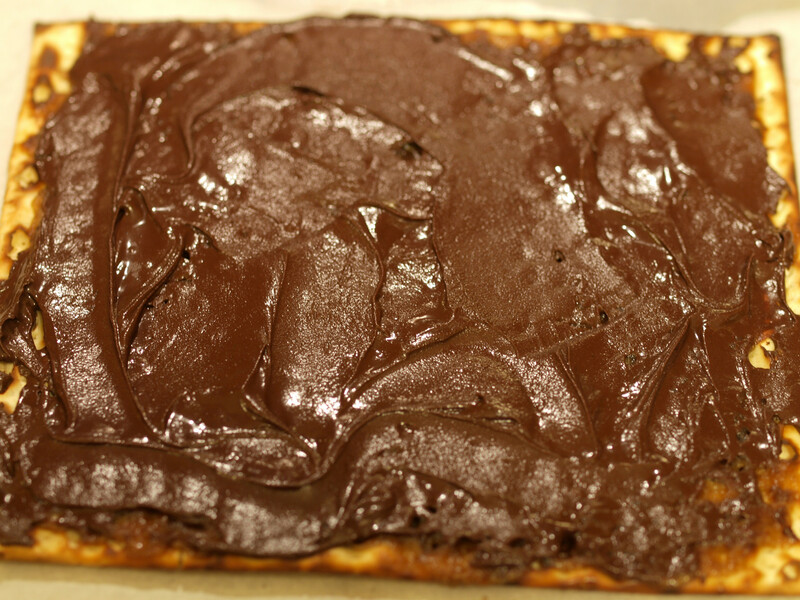 The mascarpone, as you will see in the photos below, was added on top of the chocolate and before the almonds. Finally, the macaroon, any flavor that you prefer, was crumbled on top as the last step. Like I said, I was having issues with coming up with a new, creative grilled cheese for Passover. I had already exhausted the obvious choices on previous grilled cheeses and wasn’t sure what to do for this year’s Passover grilled cheese. 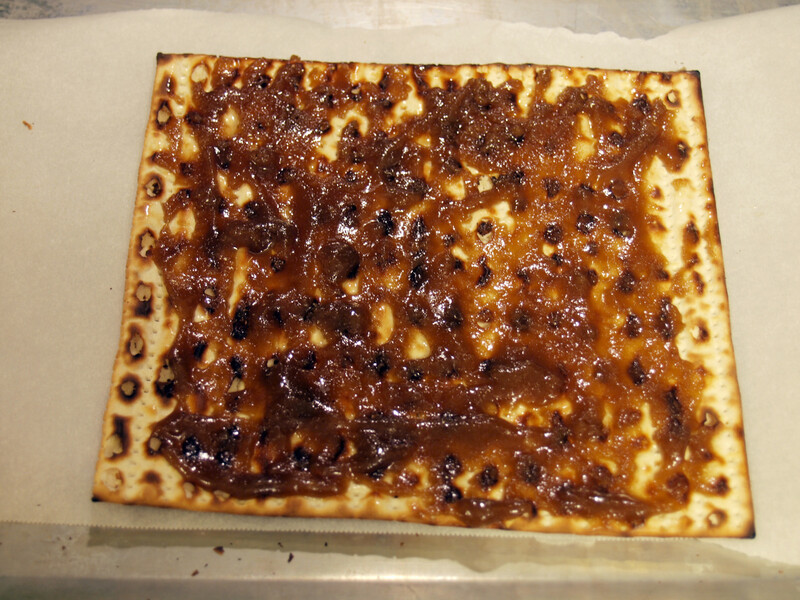 That was until I stumbled on Yumsugar’s Chocolate-Covered Almond Matzo Toffee recipe. 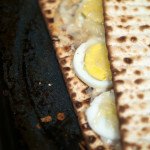 My original plan was to use and coat two pieces of the matzoh and put them on top of each other, just like a sandwich. However, after being reminded by the sous chef how rich the individual pieces would be, I decided to go with an open faced dessert grilled cheese and only use one piece of matzoh, cutting it in fourths. 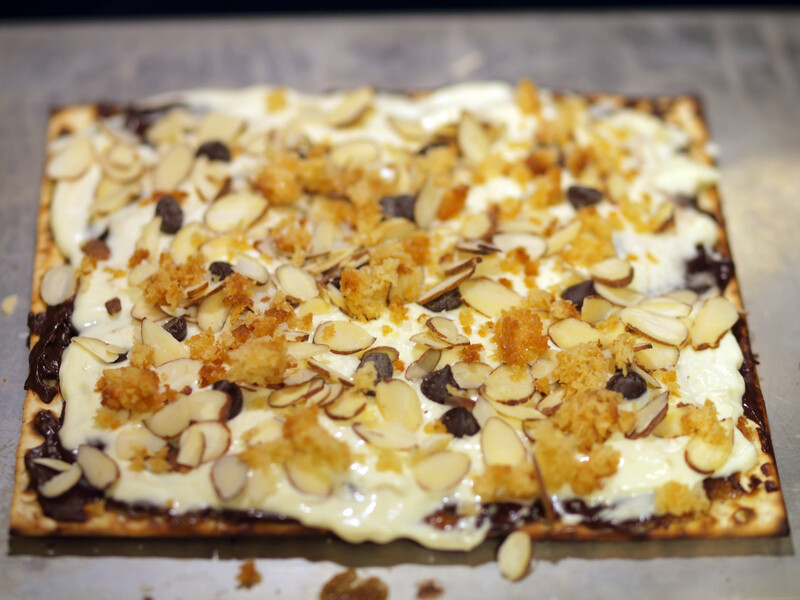 The almond toffee matzoh, with the added mascarpone and crumbled macaroons was to say the least, pretty amazing. I wasn’t sure how I would like the toffee, but after the first bite, I was hooked. Even though it was rich, I had two of the four pieces. I am not sure how much the macaroons added, but I think it was a nice touch. Even if you aren’t Jewish, I would recommend trying this. 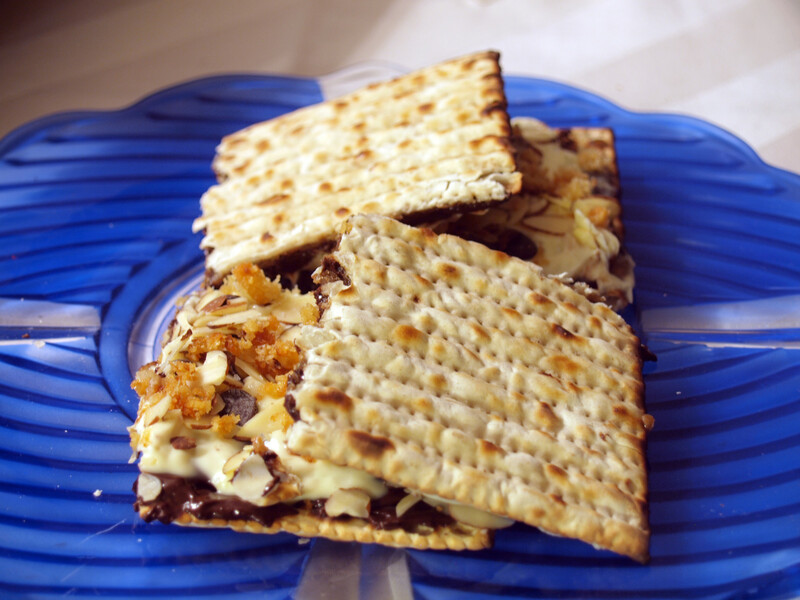 Thankfully, with all of the additional flavors on top, the matzoh simply adds texture and the resulting flavor (and grilled cheese) is straight delicious. 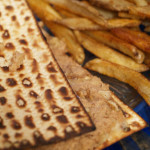 Note: All ingredients were either specifically bought “Kosher for Passover” or contained ingredients only allowed on Passover. Posted in Grilled Cheese and tagged A, almonds, brown sugar, butter, chocolate, macaroons, mascarpone, matzoh, passover, sea salt, toffee.